Hi Friends: Today's creation is a mixed media tag that was lots of fun to create! I started with a manila tag and stenciled it with white embossing paste, using the Scribble Layering Stencil. 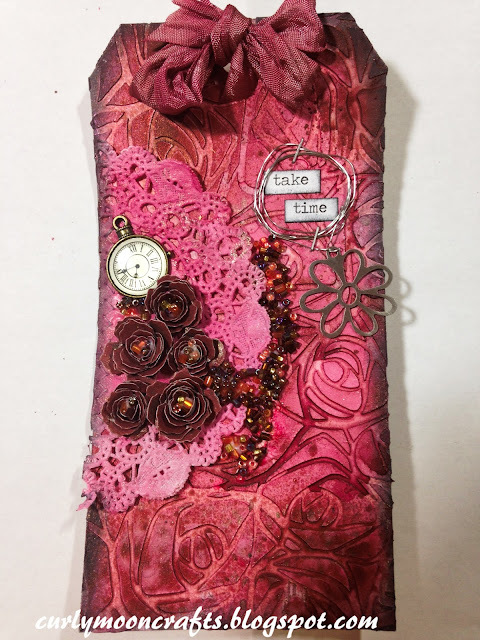 Once dry, I used several pink / red based sprays to color the background, doily, and ribbon. I also used a bit of Distress Stain on the ribbon. I used the Tiny Tattered Florals die to cut my flowers, then sprayed them with a bit of gold Perfect Pearls Mist and attached them to the doily that I added to the tag. I edged the tag and the Chit Chat stickers with Black Soot Distress Ink. I added the stickers to the tag, then stapled some wire, with attached floral charm, around the words. I finished the tag with the ribbon, clock charm, and some red seed beads. Just a reminder to never forget to Take Time to smell the roses! (or the flowers of your choice - I'm actually allergic to the smell of roses, so I prefer the lilacs! LOL) Have a great day!